Hey parents: if you've been taken in by anti-vaccine discussions on the internet, you might want to look at the newest report from the Institute of Medicine. After a lengthy and thorough review of the evidence, the IOM issued a report last week that found that the current childhood immunization schedule in the United States is safe. 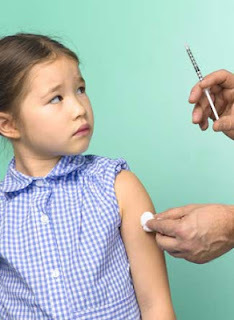 The IOM committee specifically looked for evidence that vaccination is linked to "autoimmune diseases, asthma, hypersensitivity, seizures, child developmental disorders, learning or developmental disorders, or attention deficit or disruptive disorders", including autism. Their finding: no evidence suggests a link to any of these conditions. The motivation for the report is the growing incidence of parents who worry that there are "too many, too soon" - a catchphrase that was the basis of an anti-vaccine campaign led by Generation Rescue and its spokesmodel, Jenny McCarthy. This concern, which sounds reasonable on its face, never had any evidence to support it. Anti-vaccine activists have pointed out, correctly, that the number of vaccines has increased significantly over the past several decades. The current schedule has as many as 24 immunizations in a child's first two years, and up to five injections in a single visit. The reason for this is simple: the scientific community has developed vaccines against a growing number of childhood illnesses. As a result, many diseases that used to infect millions of children each year, killing or permanently injuring thousands of infants and toddlers, have almost disappeared from modern societies. This is a good thing. Many parents have been convinced to "slow down" vaccines after hearing advice from self-proclaimed vaccination authorities, such as "Dr. Bob" Sears. Sears has published his own alternative vaccine schedule (which he apparently just made up - he certainly didn't do a scientific study) and whose has gotten rich selling his book and offering other advice. Journalist Seth Mnookin calls Sears "a first-rate huckster." In this astonishingly selfish comment, Sears admits that herd immunity works, but then says don't tell your neighbors, because then their kids might get sick and infect your unvaccinated kids. Offit's article is a thorough, point-by-point rebuttal of Sears' numerous claims, many of them either misleading or downright false. I highly recommend it. Or read the IOM's report online, for free. Don't waste your money on Dr. Bob's book. Let's hope all parents will follow the recommended vaccine schedule and ignore the voices of fear and unreason who are trying to scare them. If you're still in doubt, read the heartbreaking story, from just a few days ago, of 7-year-old Alijah Williams in New Zealand. Alijah's well-educated parents thought they were doing the right thing by withholding vaccines, after reading some scary material on the internet. Alijah was infected with tetanus last year and fought it for months, nearly dying in the process. His recovery will take 12 months, during which he will have to re-learn how to eat and walk on his own. His parents have now become activists trying to spread the word among their community that infections are the real threat - not vaccines.